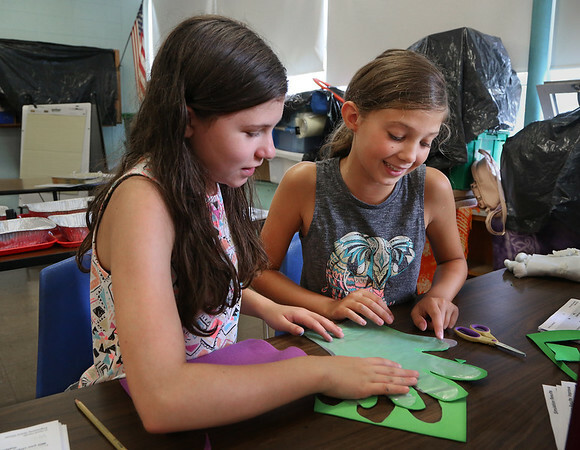 Sixth-grader Megan Pierce, left, and Fourth-grader Jocelyn Maddalena work together to cut out a "space glove" using felt during a STEAM (Science, Technology, Engineering, Art and Mathematics) Camp project Thursday at Beeman Elementary School in Gloucester. The project, part of the Museum of Science's "Engineering Adventures" program was designed to teach the students how to solve engineering problems to select the right materials to make a glove that could withstand thermal fluctuations and impacts. The six-week STEAM Camp was offered to students going into the fourth through sixth grades, and is taught by Annemarie Wentzell and Erin Schondelmeier.